Some things never change. The first wolf I ever saw, was in Denali National Park in Alaska twenty five years ago and had a green radio collar around its' neck. This one, which is my first Teton National Park wolf photo, has a black radio-collar. I got this photo last fall, by dressing in full camouflage and sitting in front of a tree to break up my outline. I had seen wolves in this area from a distance a few days before. This wolf came out of some willows and stared in my direction. It couldn't tell what I was and soon went about its' business of hunting voles. 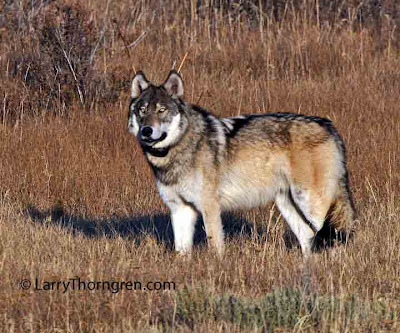 I have photographed well over a hundred wolves in the wild and have never found one that was aggressive toward me. They are quite content to go about their own routine if humans allow them to do so. I like to see wolves in our national parks, but I get really tired of seeing them with radio-collars. It somehow ruins the experience for me. I come to national parks to see wild animals, not to see tagged and collared animals that look like they belong in a zoo or game farm. Cool photo! A wolf sighting is neat, sorry about the collar. I saw a moose in the tetons that wore a collar. I still loved seeing the moose though. I found your blog a short time ago and enjoy the photography and commentary very much. I can understand using collars in some cases, but agree that they are used far too often.